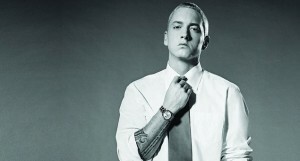 Born just outside of Kansas City, Marshall Bruce Mathers III never knew his father. His mother raised him along with his half-brother on her own. Mathers was blessed with a kind of lyrical talent, which was recognized by kids he went to high school with. Eminem attempted the ninth grade three times, but after failing his third time he decided to drop out to pursue music on a more serious note. This would begin one of the most controversial careers in music history. It wasn’t until the Slim Shady EP that he attracted any real attention. His first releases were done online, garnering almost no attention at all. Then Dr. Dre heard the Slim Shady EP and signed him almost immediately to his record label. The two co-produced Eminem’s first commercial album: The Slim Shady LP. He sold three million copies his first year, and he won a Grammy for the best rap album of the year. Eminem is no stranger to controversy. He has drawn criticism from gay and lesbian groups for his lyrics, and his own mother filed a defamation of character lawsuit against him. It’s this willingness to offend that has given him the greatest boost to his popularity. Eminem is known for his nasally voice, which compliments his rapid-fire delivery. Mathers has also performed with Elton John, despite a string of anti-gay lyrics in his songs. He is hailed by many contemporary rap artists as one of the best lyricists in the world.